It's that special time of the year where most of us love to decorate our homes for the holiday. It makes us feel so joyous, cozy and happy when we are finished. We have lots of inspiration everywhere. 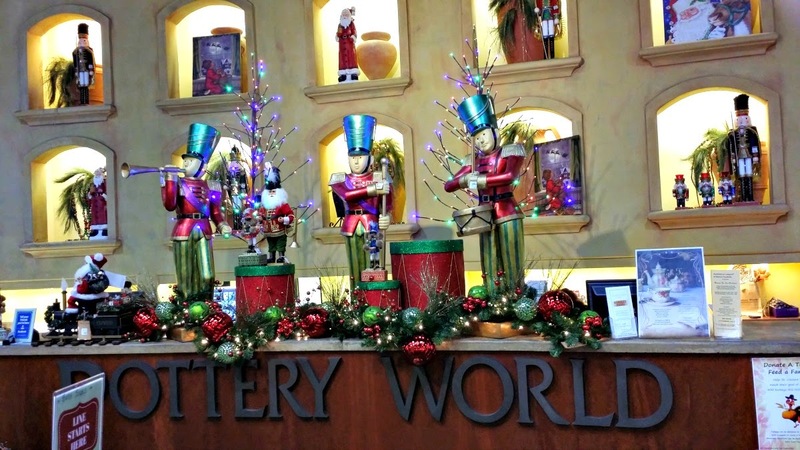 One of my favorite stores to get inspiration is Pottery World. 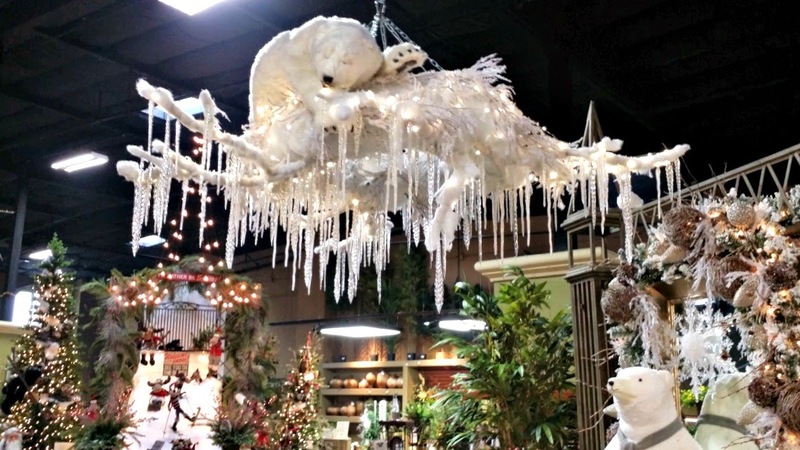 A local store that carries so many things, it's easy to get inspired. This is their check out stand. Some very cute polar bears. I love the look of the all white decor. A very cool wall tree. How about an upside down Christmas tree? 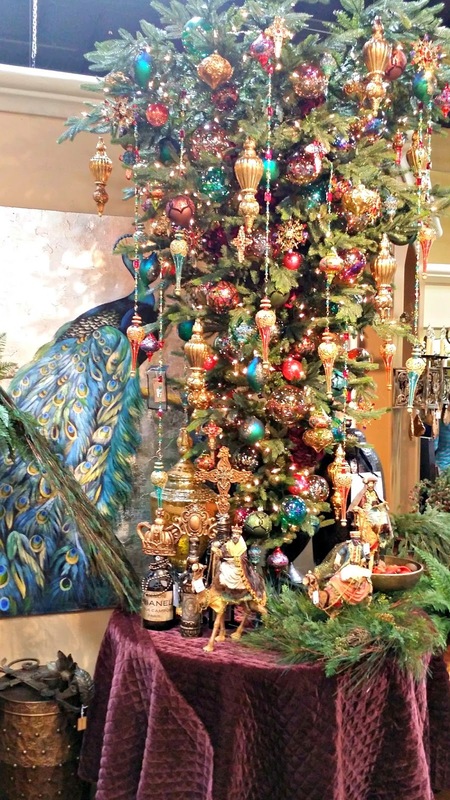 An earthy Christmas tree with a Pheasant. I will close with this silly, cute reindeer. Enjoy and have a fantastic week. That's a great store! We don't have one of them near me. I love to be inspired by the store displays. 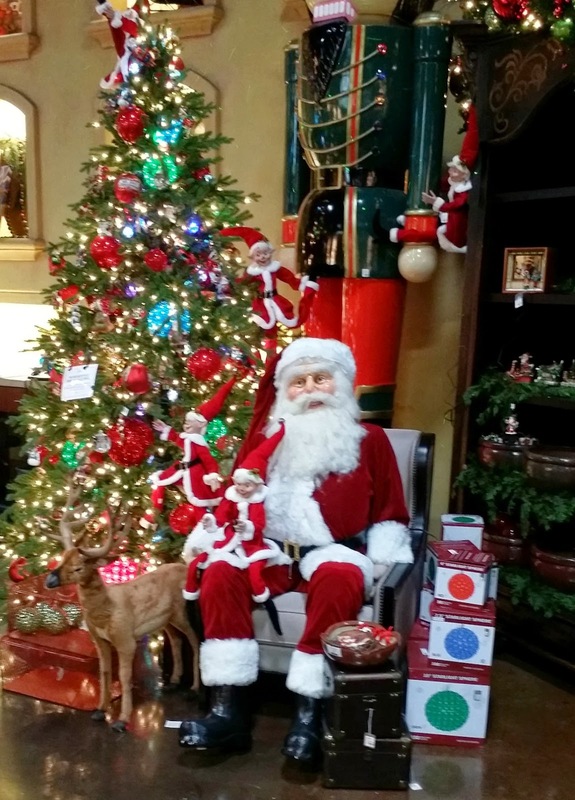 I think it would be fun to have that giant Santa sitting by our tree! Wow! Now that is some kind of decorating! Makes me tired. I just finished mine, and it looks pretty dull in comparison. That looks like the kind of store one would lose all sense of time in! I love that pheasant tree. I am not big on decorating any longer...it takes so much effort to haul everything down and pack it all up again...every year I do less and less. Have a wonderful week, Linda. That store is amazing. Wow! I am sure I could fill up my basket there. Your Christmas header and other pretty touches on your blog are so creative and festive. Looks very nice. That looks like quite a store! Amazing! I'm glad you shared it with us. I've heard you mention Pottery World, Linda, with some of your purchases. Thank you for giving us a tour of the pretty decor inside the store. I enjoyed the tour! I like gathering ideas from places like this. I took pictures when we were visiting downstate of a favorite spot I like to go. I'm in the thick of things starting my Christmas decorating. Thanks for sharing! I went around a shopping mall with my grand daughter recently and you couldn't help noticing all the Christmas decorations! I caught grand daughter's enthusiasm, but didn't buy anything! 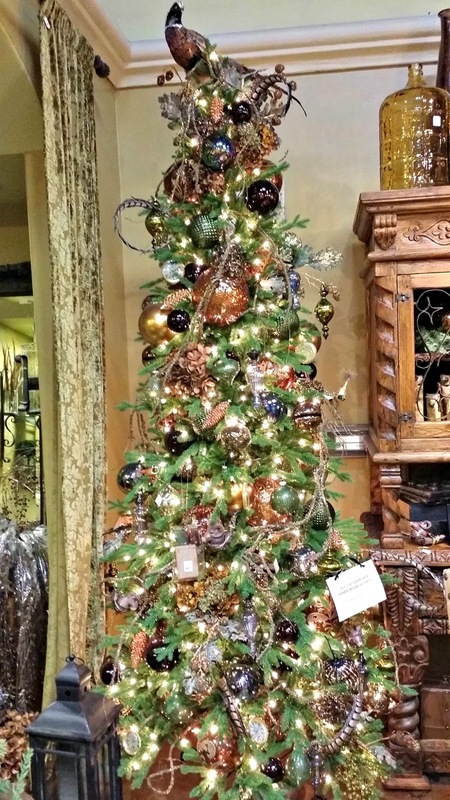 However, the displays show some good ways to decorate the home during the Christmas season. Thanks for the tour of your store. Well, it's official. I need to stop looking pictures and inspirations because from now on I go overinspired and can't stick to a theme. I love the Hot Mama Christmas at the top of your banner... and I swear when I started looking the pics I thought it was your doing - they're so much you and your taste for bling. Enjoy The Season, Dear Linda. May it bring lots of Blessings to you and your Family. Well, we do have a Pottery World about an hour from us and I have never made an effort to check it out. Thanks for posting a peek inside, now I have to make a special trip! Sure wish qwe had that store near us! I wouldn't want to leave! Thanks so much for sharing the tour. Love the check out counter!!!! What fun! 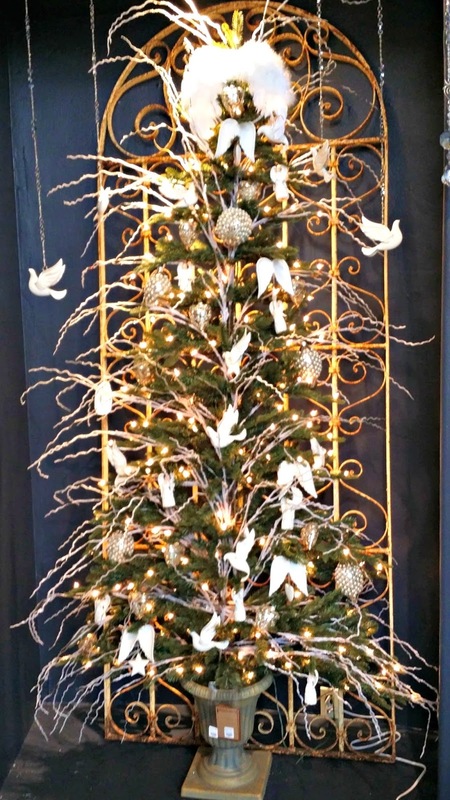 Love all white too:) and the upside-down tree is a hoot! 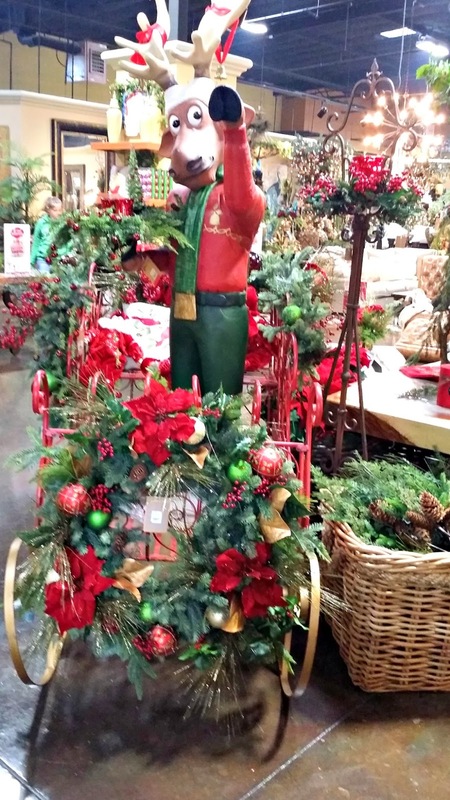 I think I'd have sensory overload in this store:) Hope your December is off to a great start! Oooo, that first photo made my ♥ skip a beat!!! How pretty!!! We don't have that company around here, that I know of. Thanks for telling us about it, Linda. What a fun place to shop, Linda! I could spend hours in there! I love visiting places like that! Good morning Linda! I was unable to leave a comment yesterday off my tablet, but OH THE BLING! I had started decorating a week ago, but must finish this weekend! I too love the all white and silver look along with woodland elements - it adds such a rustic/chic look! Hello sweet Linda! I just came home from school but stopped off at one of my favorite shops in the city. 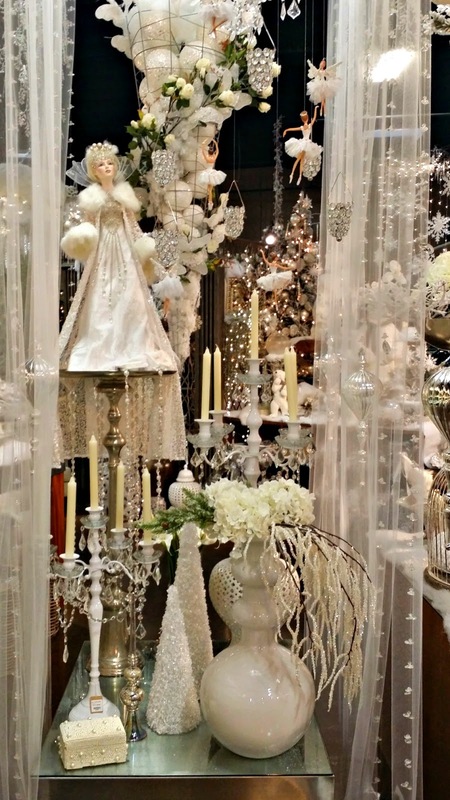 I thought of your gorgeous post here because the shop's owner put on such a fabulous display of white flocked trees, lots of silver, mercury glass and other SPARKLING things! I got such a rush of inspiration. Thank you so much for coming back to visit and it's good to hear you had a good Thanksgiving and that you son is recovering. Bless him and YOU! The countdown is now on for the holiday...YAHOO! 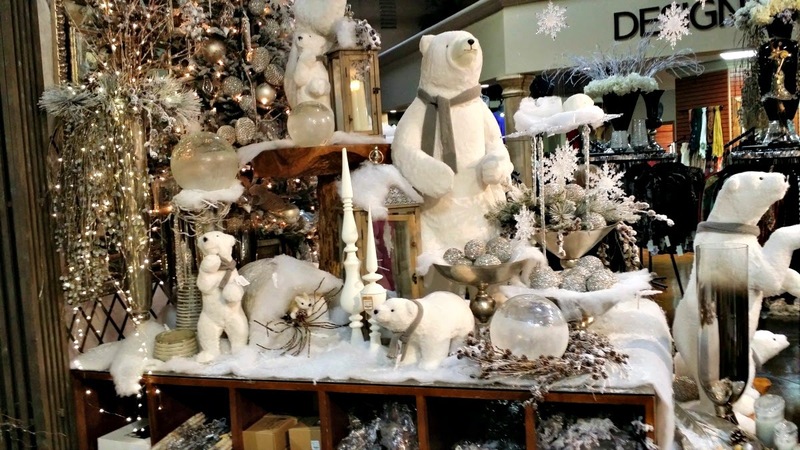 Hi Linda, oh what a wonderful store, love the all white too, especially the polar bears. Happy Holidays! Oh yum! I would love that store too! We have Tai Pan and I was just thinking today I should do another inspirational one from them. Everyone always asks what Tai Pan is. I wish we had a Pottery world!!! Oh, I just saw your header too! Love, love, love it! What a fun surprise to open mine!!! Hi Linda, wow so much inspiration here for Christmas. 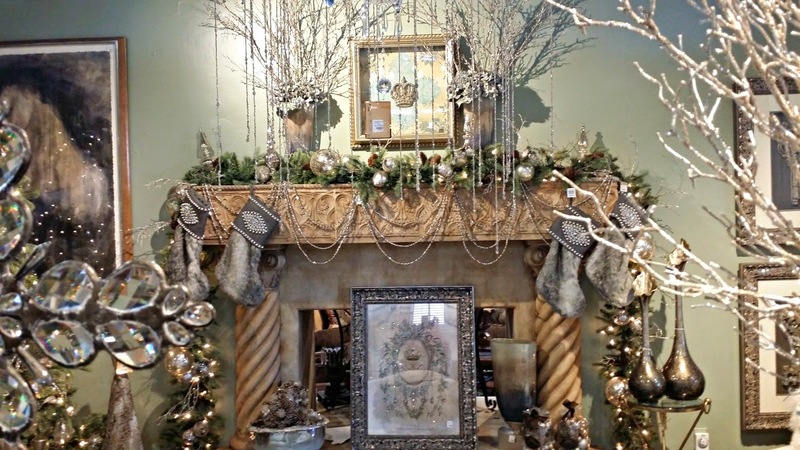 I love all the trees and the first mantel is incredible. Yes a little bling for Christmas is perfect. Thanks for sharing this amazing shop. This just rocks my world! We don't have a Pottery World here, but if we did I'm sure I'd be a frequent visitor...and always broke!!! Gosh, such pretty stuff!!!!! I missed my date to go with you =) Happy Decorating hun... sure your home will be beautiful! First year with the New Kitchen, right? Enjoy and happy baking!! 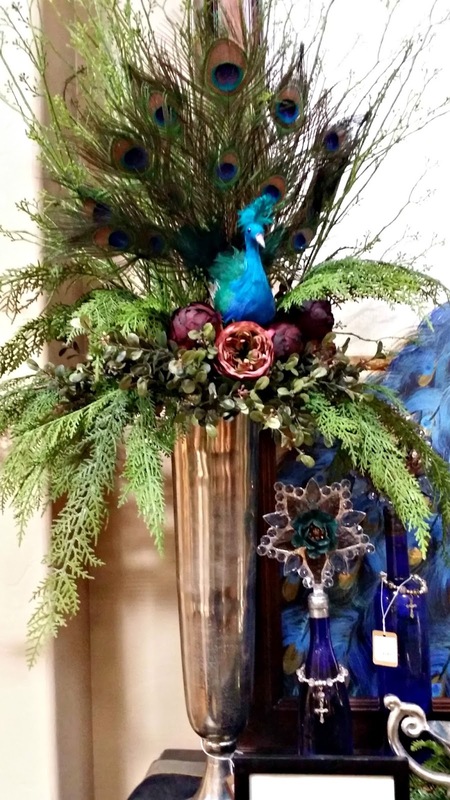 What fun decorating ideas. Lots of great inspiration. I feel so unworthy with my little table top Christmas tree after seeing all of these beautiful ones.